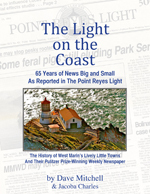 Several of us read our contributions to the latest volume of the West Marin Review during a party Sunday at the Bolinas Museum, and on our way back to Point Reyes Station, I told my girlfriend Lynn Axelrod about the time in 1853 when William Tecumseh Sherman was shipwrecked near Bolinas twice in a single day. 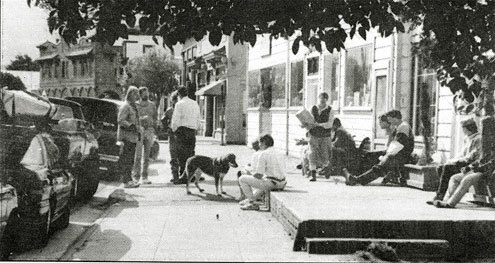 Lynn had never heard the story, which made me realize there is undoubtedly a lot of West Marin history that today’s residents are unaware of. Take the story of Sherman (at left), for example. 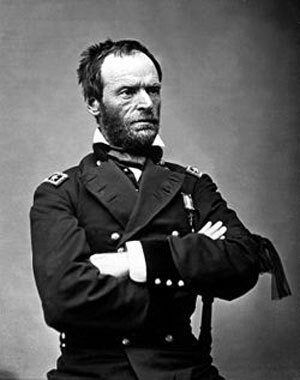 Most of us know of Sherman as the major general in the Union Army who led a “March to the Sea” in 1857, leaving a swath of destruction across Georgia. Just four years earlier, however, Sherman was named manager of the San Francisco branch of a St. Louis bank and bought passage on a ship to get here. But the ship overshot the Golden Gate in heavy fog and wrecked on Bolinas’ Duxbury Reef. The passengers and crew all survived, and Sherman set off on foot to report the wreck. When he came upon a logging camp, he was told that steamers, mostly carrying lumber and farm products, departed daily from Bolinas for San Francisco. Sherman got a ride on a steamer, only to have waves swamp it while it was crossing the Golden Gate. Fortunately for Sherman, he was rescued by a passing boat from his second shipwreck in one day. The Olema Valley, north from Bolinas, is also rich in forgotten history. 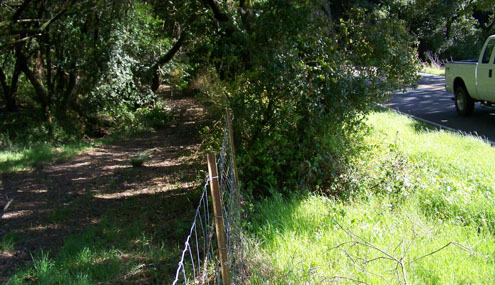 Just south of Olema Cemetery, for example, the remains of the ancient stagecoach road that once connected Bolinas and Olema can be seen under a stand of oak and bay trees on the east side of Highway 1 where it winds up a hill. 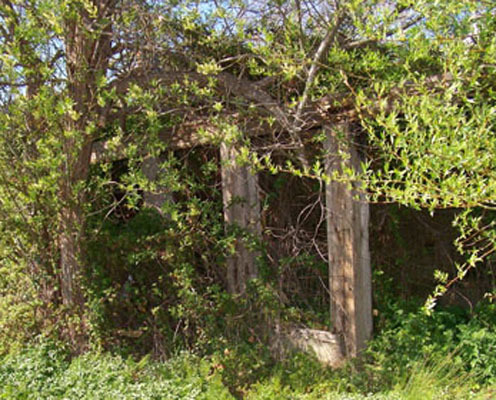 A bit to the south, the stagecoach road can be found on the west side of Highway 1 across from the boarded-up Randall House. Before writing these tales Tuesday, I doubled checked my facts with historian Dewey Livingston of Inverness, and he noted that people often confuse parts the stagecoach road with trails. Travelers get off the North Shore Railroad train at right in Point Reyes Station. Point Reyes Station is obviously rich in relics of days gone by, but there is much that goes unrecognized. The town was born when a narrow-gauge railroad from Sausalito to Cazadero opened in 1875. What started as a whistlestop in a cow pasture owned by Mary Burdell became a town subdivided by her husband Galen, a dentist. Soon there was a depot on the main street, but it was turned 180 degrees when tracks east of town were converted to standard gauge in 1920. The narrow gauge up the coast shut down in 1930, and the standard gauge east of town closed in 1933. The line had never been profitable, and the Great Depression, along with the advent of competition from trucks, brought about the end of West Marin’s railroad era. The former Point Reyes Station depot is now the town’s post office. One curiosity from those days is the north wall of the Cheda Building, which once contained a warehouse for the Grandi Company general store nextdoor. The narrow-gauge tracks on the main street had a sidetrack leading to the back of the building. 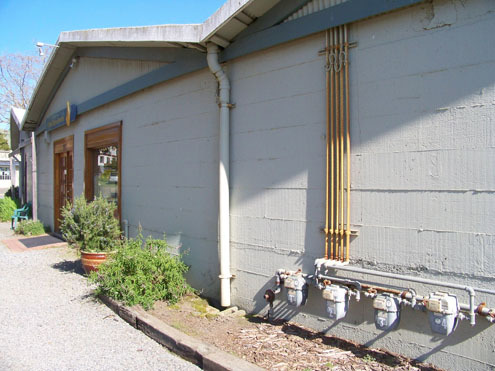 Unlike cars, trains cannot make right-angle turns, so the north wall (the side of the building where the Point Reyes Jeweler is today) was built with a slight curve to accommodate the radius of narrow-gauge tracks. Diagonally across the Cheda Building is Café Reyes; next to B Street downhill from the café, an ancient, wooden structure is barely visible through the foliage. In the railroad era, this was the base for a water tower. Perhaps the greatest curiosity is at the north end of the main street where the sidewalk in front of Cabaline Saddle Shop, the Bovine Bakery, and Viewpoints Gallery is higher than the adjoining sidewalk. Back in the days of the narrow-gauge trains, the building housing these businesses was another general store, the Point Reyes Emporium. The train tracks went up the main street, which was not yet paved, meaning that in wet weather, workers transporting cargo from a boxcar to the store had to slog through mud. Their solution was to build a sidewalk as high as the floor of a narrow-gauge boxcar. When a train stopped in front of the Point Reyes Emporium, workers stuck sawhorses in the mud, laid planks on top of them, and then had a level, dry passage from the floor of the boxcar to the door of the store. On June 14, 1846, American settlers living in California declared their independence from Mexico in what came to be known as the Bear Flag Revolt. At the time, all of West Marin was divided into Mexican land grants except the land around Tomales. 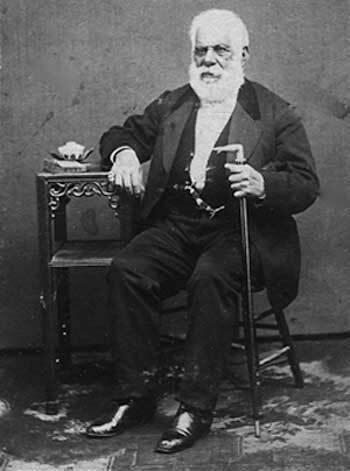 However, a tavern owner named Juan Padilla soon stepped forward and claimed that the last Mexican governor of California, Pio Pico (at right), had signed papers just two days before the revolt, giving Padilla the so-called Bolsa de Tomales as a land grant. His claim was suspect, and settlers living around Tomales immediately protested. The land was sold and resold half a dozen times in the next few years while more and more settlers took up residence on it. During a series of court hearings, the settlers claimed that Pico’s signature was forged, that the land grant was back dated, and that Padilla never lived on the land — a requirement for a land grant. Despite the claims, a judge in 1857 ruled against the settlers, who were infuriated. A town meeting was held, but the only resident calm enough to offer sage advice was a carpenter named William Vanderbilt. The settlers then agreed Vanderbilt should represent them in an appeal of the judge’s decision. In 1864, Congress put the matter permanently to rest, passing legislation that guaranteed the settlers their property rights. All this is in the history books. You can look it up. Thanks for the history. I saved it in my folder for W. Marin Lore, and will read it again at my leisure. I encourage more of this stuff. Sparsely Sage and Timely is powered by	WordPress 4.9.10 and delivered to you in 0.521 seconds using 56 queries.